If you’re getting married, we’re sure your list of wedding prep to-dos is probably extensive at this point. Flowers, makeup appointments and venue visits may be taking up the majority of your time, and while you know you should be getting in a few more workouts to look your absolute best in your dress, we know scheduling gym time might seem impossible. With the Julian Walker Fitness System, you can get a full-body workout in in a minimal amount of time – meaning you can maintain your busy schedule without neglecting your fitness routine. At Julian Walker Studios, we have a specially designed JULIAN WALKER BRIDAL FITNESS SYSTEM offers one-on-one training to help brides meet their wedding-day-body goals. 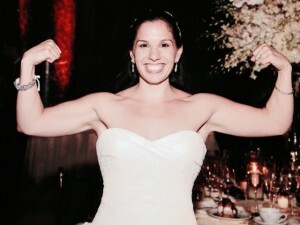 As a Buff Brides Master Trainer, Julian Walker devises a routine to hit all the “problem-areas” and deliver results fast. Training for your gown: Whether you ordered your dress a size smaller so that you had to reach your weight-loss goals, or found a dress that highlights certain aspects of your body, we train with you so that you stand out in your dress and really work it. Complete workouts over fad diets: It may be tempting to jump on a crash diet once you see the date on the horizon, but we highly recommend against that since they can be highly restrictive in calorie counts and nutrients, and you need all the energy you can get going into your wedding. Instead, we focus on helping you create a healthy, balanced and sustainable diet, while helping your body utilize those nutrients to get in shape. Keeping your schedule open: One thing all our brides love about our BRIDAL FITNESS SYSTEM is that they can get into the studio, get a full-body workout, and get on with their lives. The TRX system targets several areas at the same time, which saves you time. While your schedule may seem overwhelming, we don’t add to your stress, instead we make workouts quick but effective. A summer wedding may seem miles away, but it’ll be here before you know it. While our specially-designed wedding workout system promises rapid results, it’s best you get into the studio and back on track sooner than later. In fact, the sooner you contact the Julian Walker Studio and sign up for a personal trainer, the sooner you can get on track to an amazing wedding-day body and mark one more thing off your to-do list. For the best in private trainer access and TRX training in Murry Hill, Flatiron, Manhattan and Midtown East, contact Julian Walker Studio to schedule your BUFF BRIDE training session. You can also bring in your groom or bridesmaids for a duet or semi-private training session. All eyes will be on you on your big day, our goal is to help you feel confident.